Back when the Internet first launched, long before Facebook or Twitter or even AOL, it used to be incredibly difficult to do anything on the world-wide-web. It was mostly like an old Ham radio club – made up of electronic bulletin boards, government nodes and university hubs. Even after AOL rose and fell and the popularization of the Internet exploded, most people would have been ill-equipped to construct their own virtual platform in cyberspace. That required knowledge of computer languages. ColdFusion, Java, Python, PHP and Hypertext Markup Language (HTML) were designed to be easier to understand than the denser Silicon Valley programming languages. But still, one wrong keystroke could cripple your site and take hours if not days to systematically track down. There were also plenty of virtual plug-and-play systems like GeoCities, NetScape, Tripod, Lycos & Angelfire, where you could upload and insert your pictures, musings and game cheat codes into pre-built, but rather boring templates. Some companies did attempt to generate business on these web-builders, but they were largely used by hobbyists – including, allegedly, a young Mark Zuckerberg. All that changed in 2003 with the launch of the one platform that would rule them all – WordPress. Developed by a couple of computer nerds as a more efficient way of posting through the cafelog community of bloggers, it was at first just an alternative blogging site. But when MoveableType, the preeminent blogging platform at the time changed their terms of service, hundreds of bloggers fled to WordPress. When Do We Get to the Non-Techie Part? Glad you asked. One of the reasons WordPress shifted from a blogging platform to a Content Management System (CMS) behemoth is because of its ease of use. Even the most inexperienced person can quickly set up a site and start blogging sharing content with the virtual world. But chances are you probably already know that. Either you came here to make sure you’re doing it right, or to find out if it’s really that simple. The short answer is yes. Not only is WordPress easy to install and customize, the beauty of its under-the-hood design offers huge advantages to businesses in terms of automation, search engine visibility, mobile-friendly design and content curation, just to name a few. And it does it without you needing to understand what’s going on under the hood. Just like you don’t need to know how a combustion engine works to drive a car. But I’d be lying to you if I didn’t point out that there are a few things that you need to do to keep your WordPress purring like a kitten. Routine maintenance, fuel, and the occasional car wash. And another step that doesn’t really translate to the car metaphor, so we’ll look at it first. For the sake of brevity, for the following. I’m going to assume you’ve already set up your WordPress site. Just like your hard drives – you do know you need to backup your hard drives, right? – you have to routinely backup your WordPress site. And the first rule of backing up? Don’t rely on your web hosting service to do it for you. Seriously, don’t. If they offer or automatically do backups, take advantage of that service, but don’t rely on it. The nice thing is, WordPress is relatively self-contained and easy to track within your site. Depending on the size of your installation, you can actually just save a copy of your WordPress site on your office computer (with its own backup, of course). Alternatively, you can use Google Drive, DropBox, or MS One Drive. If you’re creating a lot of daily content, I’d back up at least once a week. If your posts and added pages are a little more spread out, once a month is fine. The key is to make sure if when your site crashes or loses data, it’s not too terribly difficult to recoup it. And ALWAYS backup before you upgrade your WordPress install or Plugins. Even though WordPress itself and literally thousands of plugins and themes are free, there is a significant, active and growing development team behind it. There are 6 full-time Lead Developers, including the founders of the service. There are also at least a dozen, at any one time, contributors to the development. And because WordPress is open source, they invite anyone to volunteer their skills to make the community better. Unfortunately, that openness and free access to code means that they’re often targeted by hackers. I mean, if you were someone looking to make an illegal impact on the world, why not target the millions of websites built on WordPress, including the New York Times, Walt Disney and former President Obama’s charity foundation. There are two types of updates that everyone needs to worry about. For most people, these updates need to be routinely applied to your WordPress dashboard, with little to no impact to your system other than bolstering security and adding minor features. Since Build 3.7, unless you specifically turn them off, these updates will automatically happen. My advice, let them. Your website will be better protected and work better and you don’t even have to think about it. When there is a major bug in the system, or just when the development team makes great strides in speed, reliability and security, they release a bigger update – or a brand new system build. Because this is a larger, more encompassing task, it is vital that you do a backup immediately before upgrading. That way you have a fully functional version of your existing site and plugins in case something goes wrong. Let me point out that the development team at WordPress is extremely conscientious about making sure these updates roll out. Far more than other paid services and platforms (cough, Microsoft, cough). However, due to the thousands, if not millions of plugins out there for WordPress, they cannot take into account every single contingency. Which is why WordPress is a community. They rely on users to let them know if something doesn’t work and what you’re running alongside of WordPress to fix that particular issue. It is easy to see when an update is available on your WordPress dashboard. At the very top of the Dashboard on the left side are two links: Home and Upgrades. If there is a fix or upgrade available, you will see a dark orange circle with a number inside next to the Upgrades link. Click on it to see exactly what’s there. Even if you don’t go to the dashboard that often, I recommend checking it once a month. That way you’re always running the best, safest version of the platform. The upgrading itself, is really easy. It’s literally a few button clicks, and reminders to back your site up. I would also do a second backup of your site on the new version so you have it handy as well. Just like backing up, there are plugins you can install that will alert you when there is a new update. You’d be amazed at how many people and companies build their websites on WordPress (or other platforms) and then just walk away and forget it. It’s not a crock pot, it’s your business! WordPress works really great boosting your site for maximum search engine visibility, but if you’re not filling the tank, the engine will run dry really quickly. While you don’t have to do daily posts, the more content you post – consistently – keeps your tank topped off. Car metaphors aside, as often as they’ve changed their algorithms, Google still ranks sites based on the usefulness and consistency of the content found there. At Grow the Dream, we recommend one post a week, posted on or about the same time, on the same day. This not only keeps the motor running, but the friendly Googlebots remember to pop by your site at the same time each week to see what’s shaking. Give them something to read and further index and they’ll keep your ranking rising. What do you post about? Stop me if you’ve heard this one – the best content is posts that answer the questions your ideal clients are asking. You know, back to that strategic work. That’s the high-octane fuel you need. Specific landing pages for each of your niche markets also helps keep you on the top of the various search engines’ robot brains. Again, work off your strategic marketing work to prioritize and build them. Within WordPress, you can build your own pages, or, a better solution is to add Optimize Press or integrate your Infusionsoft with WordPress. Both create high functioning landing pages that attract the right customers. Infusionsoft also works very efficiently with WordPress to offer and fulfil your Lead Magnet(s). As we mentioned at the beginning of the year, the more you can automate your business, the more time you have to build it. Once built, conceivably you could just leave your site as is, making sure you update when necessary and adding regular content. 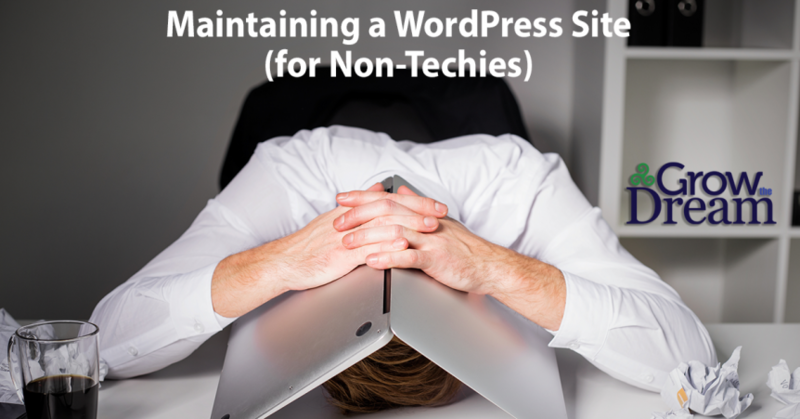 But some people like to do a little spring cleaning – and often WordPress encourages that. Whenever there is a new major build, it comes with the latest, newfangled theme pre-installed. You can either keep your current theme, or experiment some to see how things look different. As I mentioned earlier, WordPress upgrades are often faster and more responsive than earlier versions, so if you have the time, why not play a little bit. After all, you have your backup, right? And speaking of responsive – another great reason to have a WordPress site in the first place, and keep it up to date – there’s a good chance you’re reading this article on our WordPress site, on a mobile device – a smart phone, a tablet, or the heads-up display on your car. Okay, maybe not that one yet. But soon. One of the reasons WordPress has remained at the forefront of CMS site builders? Because they led the way making their architecture mobile-friendly. Google now ranks sites even higher based on their speed of loading and their Responsive design – responsive in this case meaning completely accessible and unbroken on mobile devices – ALL mobile devices. This essentially means that the biggest headache for most companies who have websites isn’t one for WordPress users, and you didn’t even have to think about it or ask for it. Once again, it’s installed automatically. If you’re feeling ambitious and really want to get under the hood, we’ve got a multitude of resources on our site, from really diving deep into strategic work, to connecting and integrating your business and website, both hands-on and automated. You can check out the top resources we recommend here. But whether you’re a chronic shiny-object addicted techie like our fearless leader, or a newbie just hoping to get it right, I hope this post have given you insight into how WordPress makes your life easier – and hope that you can make it work for you – and don’t end up like the guy in our title graphic. If there’s anything we can do to help you grow your dream, please let us know. It’s our greatest passion and ongoing mission to make your business succeed!